EDIT: Thank you so much for your help! The changes made have worked out to be beneficial to our family thanks to your support. We still need to fight to cover those who have retired, but we were able to keep the services we have. Non-active duty family members will have a 10% cost-share. The Operations Manual acknowledges that this cost share can be $125 to $200 per week. 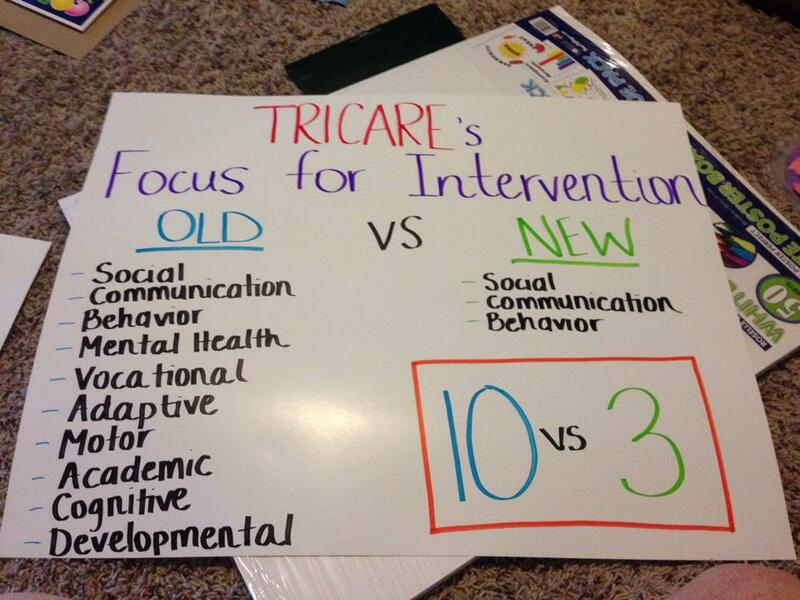 A 2 year limit is placed on therapy with Tricare conducting a comprehensive review before authorization of more ABA. It is unclear what will be required in order for ABA to be extended, but most children with require more than 2 years of ABA therapy. Services paid to a BCBA were cut in half, while BCaBA dropped by nearly 2/3rds. Since ABA is mostly done in home and therapists can only charge for time spend with client, current rates help with costs related to travel, purchasing supplies, designing programs, etc. The quality and availability of ABA therapists, already limited in some areas, will drop considerably. Covered skills has been reduced tremendously with all educational and vocational goals dropped. This includes daily living skills, potty training, learning how to use a phone, basic self-care, and many other issues that can mean the difference between a child needing specialized instruction and education and attending regular classes. Excluding educational skills limits access to specialized autism schools and addressing skills in a school setting. It is already very difficult to get ABA therapists in the classroom. Requiring a projected duration of ABA and a discharge plan shows ignorance of the nature of autism, which is usually a lifelong disorder with no cure. The discharge criteria means that Tricare can cut services if they feel that not enough progress has been made. Regressions are common in autistic children, especially children places in stressful situations such as moves or deployments. While the no annual cap on therapy is a very welcome change, the therapists need to be paid a fair wage in order for us to obtain the services we need. 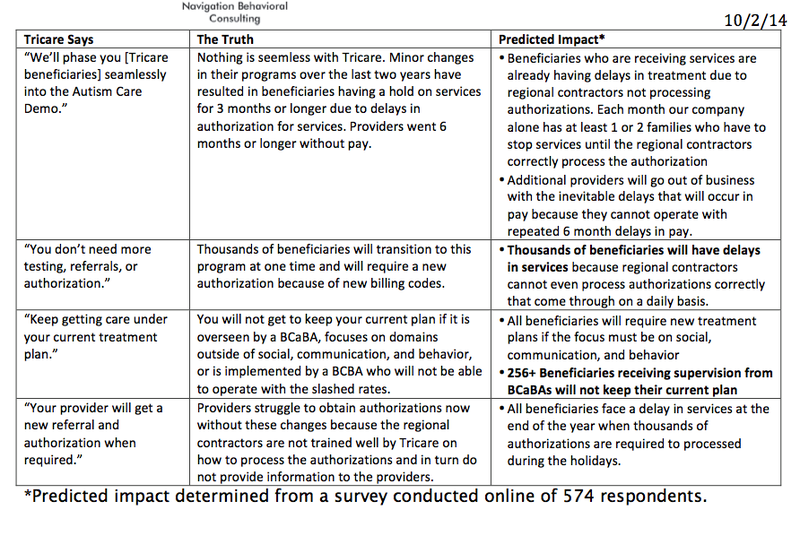 Navigation Behavioral Consulting has released these charts explaining why they object to some of the changes. What you can do: Contact your representative and your senator. Explain the changes that will harm military families. 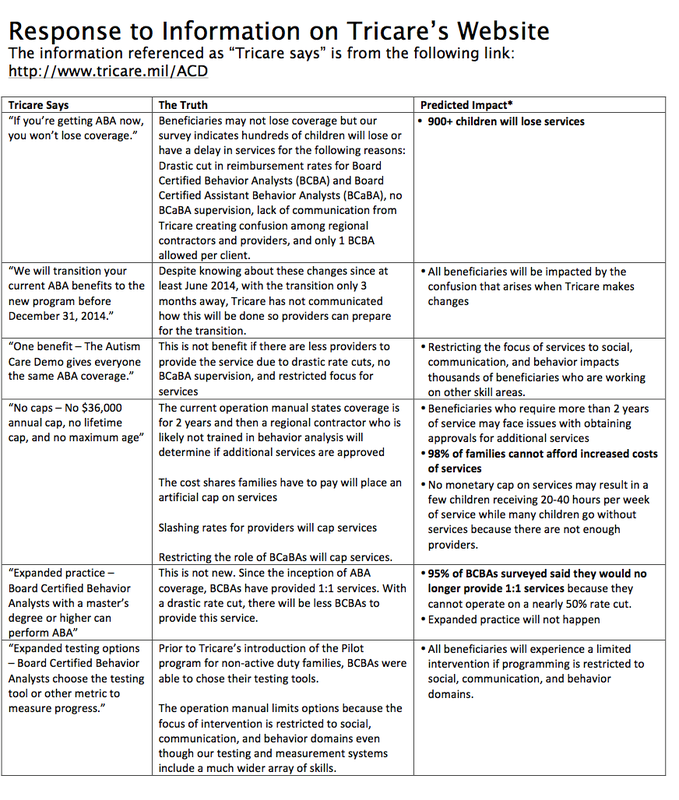 Contact Richard Hart of Tricare Policy and Operations richard.hart@dha.mil Contact local media outlets, especially if you live near a military post and have an autistic child. Explain how some of these changes will harm services. *edited to add images from Navigation Behavioral Consulting showing details of the changes.